In last week's blog post, I mentioned several times that doing marketing as an indie requires creativity. It is easy to buy advertisement space, but it is a lot more challenging to come up with things that are so interesting that press will write about them for free. 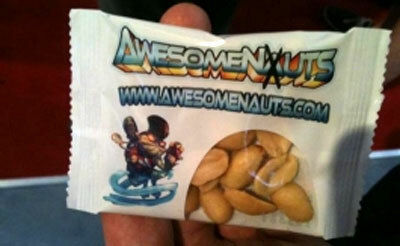 For Awesomenauts we had a little bit more budget for marketing, so we had these special bags of Awesomenuts made to hand out at Gamescom 2011. The naming pun is so good it was just impossible not to! I still consider this one of our best marketing tricks. For players who got all the achievements in the WiiWare version of Swords & Soldiers, a special code was generated that they could e-mail to us. We promised the first people to do so a bag of Swords & Soldiers swag, which amongst other things included the special poster above (autographs of the entire team are on the back). We announced this before the game launched, and we actually saw quite a few people online discuss how fanatically they were going to play on launch day to win one of the prizes. The buzz was nice, and as a bonus it turned out that one of the winners was a game journalist, who posted the contents of what he won as a news article on a big WiiWare site. A friendly marketeer was nice enough to help us with some press releases, and he came up with the term "Morefun (tm)", which is something we had apparently come up with in our game laboratory. It made no sense at all, but it was funny and quite a few websites picked up on it. This is a nice example of how something as small as the way you word a press release can already have an impact on how well your game is covered! 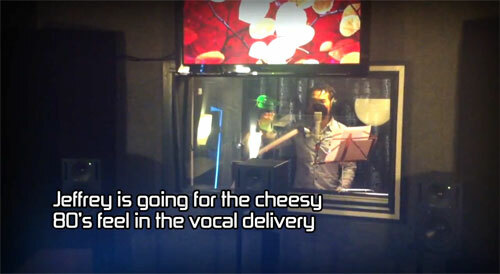 For Awesomenauts we had an intro made with a real theme song, for which this great singer was hired. The song turned out to be a great central piece for our marketing efforts. 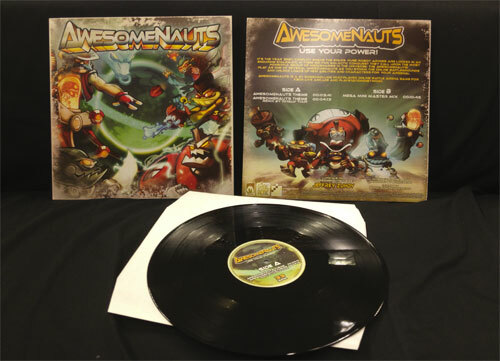 All our trailers end spectacularly on a high note by Jeffrey, and the cheesiness of it all got a lot of buzz going when we first announced Awesomenauts! 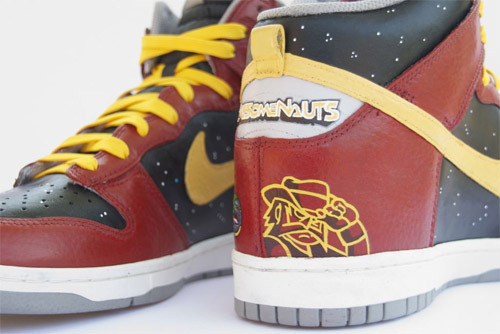 When we learned it was possible to order special shoes themed to your own game, we just couldn't not order them for Awesomenauts. These shoes were recently given away as the main prize in a competition that some website ran. 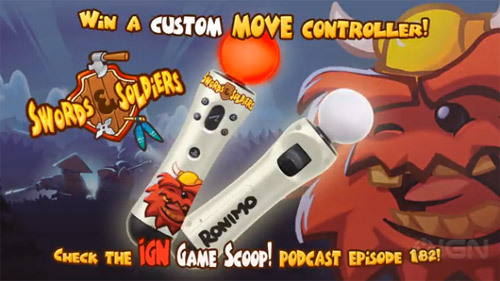 A lot cheaper to do were these custom Swords & Soldiers Move controllers, since we customised them ourselves. These were given away at a contest on IGN. We had hoped to reach front page with this, but in the end IGN didn't post it that big, so the actual reach of this was limited. Still, fun swag to make! This is an example from a totally different category. Making more than one or two trailers require that you look at your game creatively. You need to think about how it can be something new and interesting in every video. 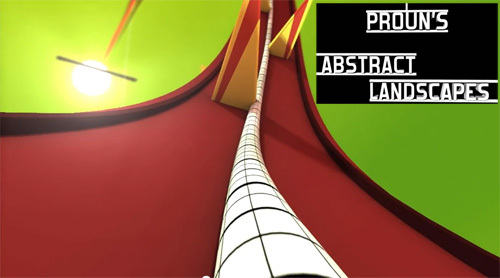 For Proun I made a video in extreme slow-motion, which differs greatly from the speed of the real game, but is pretty mesmerizing to watch. I did not choose Pay What You Want for Proun as a marketing gimmick, but it turned out to be a great trick for that indeed! 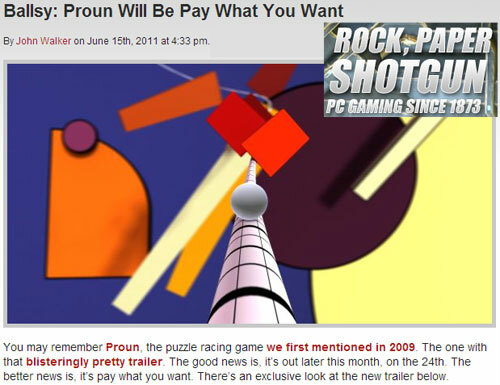 As far as I know, Proun was at that point the biggest game to ever be Pay What You Want right from launch day. The Pay What You Want model was also still quite new to games at the time, so press picked up on this massively and it drove tons of extra attention and sympathy to the game. Another example of something that was not intended as marketing, but turned out to be great for it: a couple of months after Proun's launch, I released the complete sales data for Proun, plus an analysis of what I thought it all meant. Revealing sales data like this is extremely rare in the games industry and was thus picked up as news by lots of sites. The result was a lot of extra sales, and I think in the end around 10% of the total sales of Proun happened because of that one blogpost. The main reason De Blob managed to take off and get enough interest that THQ decided to buy the rights and make two console reimaginings, is that we put out entire version of the game online for free. 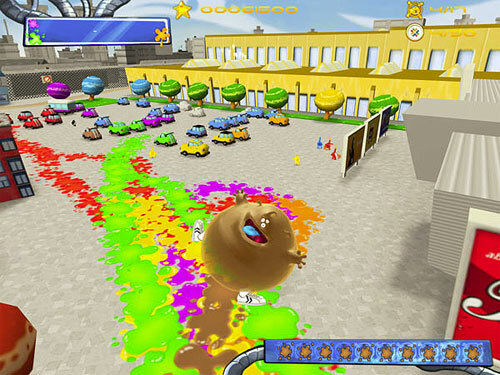 Looking back, our version of De Blob can be considered to have been a prototype for the final version, which we released online as a marketing trick to increase interest in the game, and to see whether the concepts were good enough for a bigger game. 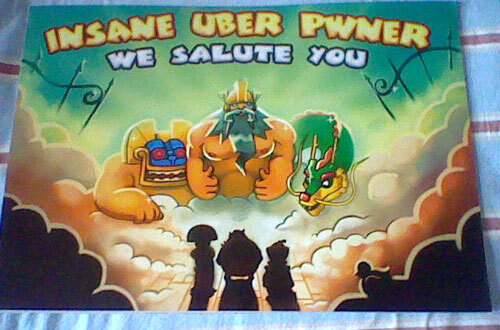 Apparently sometimes just throwing your early stuff on forums can be a great marketing trick! If I ever received a bag of dubious nuts from you, I don't know if I'd eat them! Another fun blog post, Joost. I'm actually surprised at the amount of swag you all created for your games. For Filmadeus I'm considering printing some flyers to leave at select cinemas, but that's super pedestrian compared to hot sauce antics! Awesome post, very useful recap! This is why I am so proud to be dutch :) But for proper matters, I will type this in english. (Hmm I would love to see how you guys work for one day... Maybe you can make a contest "A normal Ronimo day"
Really enjoyed reading the post. Some great ideas for marketing. I've noticed that being funny tends to attract a lot of attention from the press! Being funny does require a good sense of humour, which is something I wouldn't be able to do myself. Marketing really needs to fit your own style, and some of my colleagues are great at this kind of humour. For Proun I did the marketing on my own and I used a more serious, artsy tone. 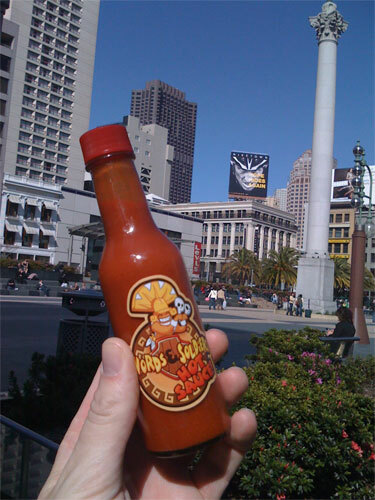 I generally prefer eating hot sauce from a bottle that's been soaked in a hotel bathtub.